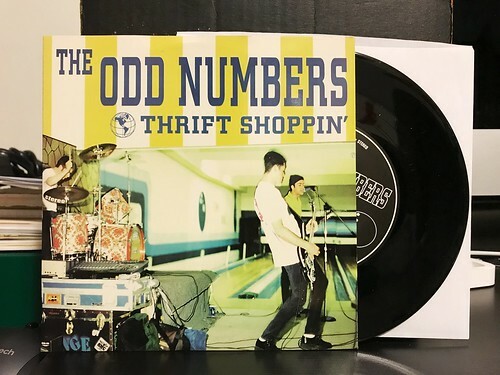 I Buy Way Too Many Records Dot Com: The Odd Numbers - Thrift Shoppin' 7"
I am getting closer to wrapping up the pile of Odd Numbers 7"s I recently picked up. This is a later era one that came out of Sessions records. Like many of their 7"s, you can also find these two songs on a full album as well, this time the songs are also on The Trials And Tribulations Of The Odd Numbers. That's a record of theirs I'l admittedly not familiar with. I don't own it and honestly, I didn't even know it was out there. It'll have to be a pick up at some point. That being said, for the first time I've been writing about The Odd Numbers both songs on this 7" are new to me. "Thrift Shoppin'" is a pretty standard fast paced Odd Numbers songs. Building over a bass line that rises and falls, it has a bit of a bouncy break before the hooky chorus kicks in. A strong song for sure, even if the 'oohs' in the chorus sound a little silly. B-side "Dee Major Tom" is a bit choppier, though still retains the mod vibe that really is the hallmark of The Odd Numbers. The song isn't much shorter than "Thrift Shoppin'" but for some reason it feels like it blows by so quickly. I can't say that either of these really rank with my all-time favorite Odd Numbers songs, but both are respectable entries into their catalog.